Prada must be cursed … with hilarity! Poor Prada. Three days ago, it was models falling on their tushes because of ridic heels. 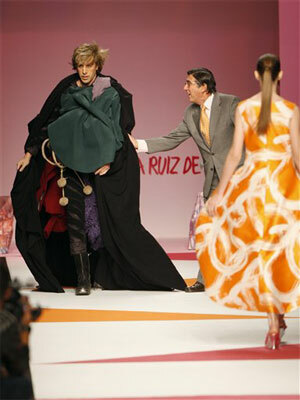 And according to Perez Hilton, yesterday Agatha Ruiz de la Prada’s runway show during Milan’s Fashion Week was interrupted by a fashionista of the comedic kind: Sascha Baron Cohen. Then, after all that hullabaloo, he managed to sneak into the model dressing room. When the models assuredly began to squeal in fright, security came in and kicked him to the curb once again. I wonder how his lovely wife and new mother Isla Fisher feels about him potentially seeing naked models? Cohen’s currently in Milan shooting for his new film Bruno: Delicious Journeys Through America for the Purpose of Making Heterosexual Male. Obviously the new film is being shot in the same low-budget, documentary style as his 2006 flick Borat: Cultural Learnings of America for Make Benefit Glorious Nation of Kazakhstan. I loved Borat, but I wasn’t going to venture to see the same sort of uncomfortable antics displayed again in Bruno. However, after hearing about his attempts to burst the high-faluten bubble of Prada, I might have to part with my $10.50 just to watch the looks on everyone’s faces. Sorry I haven’t written in a few days, I’m amidst a slightly painful job transition. Tomorrow’s my last day at my old day, and I get a little time off before I start my new one. But I digress. 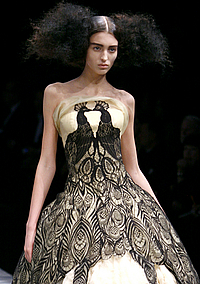 Two days ago in Milan, Miuccia Prada was showcasing her collection of crushed silks and two models fell on the runway. Both look like they were pretty painful falls. Model down! But at least her dress is fab. The falls are attributed the ridiculous five-inch heels they had to wear on the runway. I understand the necessity to put these girls in big girl shoes occasionally to help show off the clothes, but these are too much. If professional runway models can’t walk in a straight line in these things, how do they expect normal women to trapse around the streets with them on? 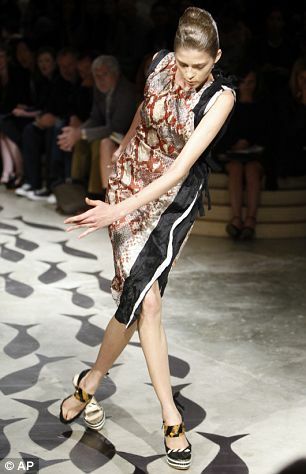 They must have noticed models tripping up in these monstrosities at dress rehearsals . Unless they didn’t have a dress rehearsal (gasp!). Makes no sense. On top of that, I doubt any fashion show attendees really want to witness an ankle breaking within 20 feet of their faces. I’ve had a severe sprain myself (due to my own clumsiness, not really the fault of the shoes I was donning) and it ain’t pretty. So Prada, get it together! If the shoes don’t work, use different ones. In conclusion, a fad that start as another method for middle-class white kids to whine about nothing now is trying to mature and come into its own as a sincere movement. I just wish it were a bit more sincere in its efforts and direction. As much as I adore and often drool over shoes, I won’t always write just about them here. I will write about all things fashion and at all prices. I’ll try, as much as possible, to focus on the fashion scene here in Atlanta. When no noteworthy events/news is floating around my fair city, I will extend my reach to the rest of the world. Not much to dislike, don’tcha know?